Several major highways either traverse or border the Everglades, and they provide access for ﬁshermen. I discuss all of them below. While the majority of anglers ﬁsh the swamps from a motorboat, you’ll ﬁnd ample opportunity as a walk-in angler—especially if you bring a canoe. Arguably the most popular highway with ﬁshermen is the portion of Interstate 75 that connects Fort Lauderdale on the Atlantic Coast with Naples on the Gulf. 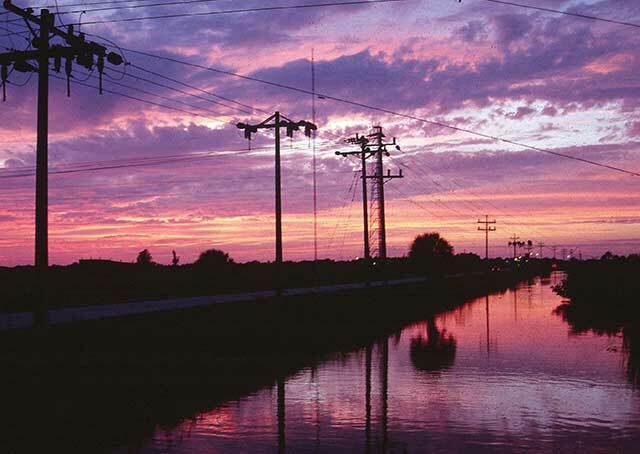 Appropriately nicknamed “Alligator Alley,” this thoroughfare is an important conduit for gameﬁsh as well as vehicles, and portions are bordered on both sides by canals. What makes the Alley so special? It’s the northernmost highway that crosses the Glades. Spring ﬁshing, as you’ll recall, moves from north to south. The exits that anglers ﬁsh most often are located within the ﬁrst 30 miles heading west from the Lauderdale tollbooth. Unless you’re willing to pull over in 70mile-per-hour trafﬁc, park in a ditch, crawl through a tangle of matted undergrowth, and climb a barbed wire fence, docks and ramps at the various launch sites are the best option, especially in spring when the ﬁsh are everywhere. I’ve caught plenty of ﬁsh from these ﬂoating structures, including hundreds of largemouths, peacocks, and even pickerel. Several seawall parking lots stretch for hundreds of yards, so an angler can cover both banks in solitude. An even better approach is to get your hands on a canoe or bass boat and work those banks you can’t reach from shore or from the ramps. As for a canoe, you’ll ﬁnd plenty of ﬁsh within paddling distance, if they’re not already there at your feet. I don’t kayak in the Everglades, due to the danger of alligators. If you’re heading west across Alligator Alley, starting with the Broward County tollbooth (mile marker 26), you’ll ﬁnd ramps on both sides of the road at (or near) mile markers 31 and 39, as well as at the ﬁrst of two rest facilities, located near mile marker 36. Look for the mile markers—painted reﬂective green—along the road at one-mile intervals. The canals are bordered by dense vegetation, so I recommend launching a canoe at a well-maintained ramp or ﬁshing from one of the boat launches. Shore-bound anglers (or canoeists) can ﬁsh the Miami Canal, which passes under Alligator Alley near mile marker 36, after exiting the alley at the ﬁrst rest (not recreation) facility. This ancient conduit connects Lake Okeechobee with L-67, the north-south canal that runs parallel to U.S. 27 in western Broward County. Follow the signs once you make the turnoff. If you follow the underpass under the alley, you’ll ﬁnd another ramp on the south alley canal—where the canal heads east. If you turn around and continue heading west, you’ll cross several canals, including L-28, which passes underneath Alligator Alley near mile marker 49. L-28 is located on Miccosukee Tribe land and is off-limits to the general public. The north alley canal continues west and is less deep in the Big Cypress Preserve. This shallower portion of the canal begins at the alley’s only gas station, located just off the highway at the Snake Road exit (mile marker 50). The station, which is owned by the Miccosukees, sells food and beverages. The restrooms are clean, and you’ll even ﬁnd showers. While access to this section is severely limited, the L-28 Interceptor Canal (which intersects the alley at mile marker 52 and shouldn’t be confused with the original L-28 that’s not open to the public) offers shore-bound anglers a few miles of access. Then, both north and south the canal enters tribe land, where trespassing is prohibited. Both the Interceptor’s banks (they lie perpendicular to the alley) are reachable once you locate the turnoff, which is a pair of gravel roads that pass through a chain-link fence—not easy to see at 70 miles per hour. The gates, on either side of the road, are located above the easternmost bank—not far from the Alley bridge. Interested in crossing to the opposite bank? Take the buggy bridge a mile or two north and follow the gravel road. A new launch ramp—complete with an exit—next to the alley bridge over the Interceptor, at mile marker 52 was under construction at the time of this writing. The ramp is on the west bank, immediately north of the bridge. Winter sunset on the Tamiami Canal. This two-lane highway has served as an artery for commerce for nearly a century. 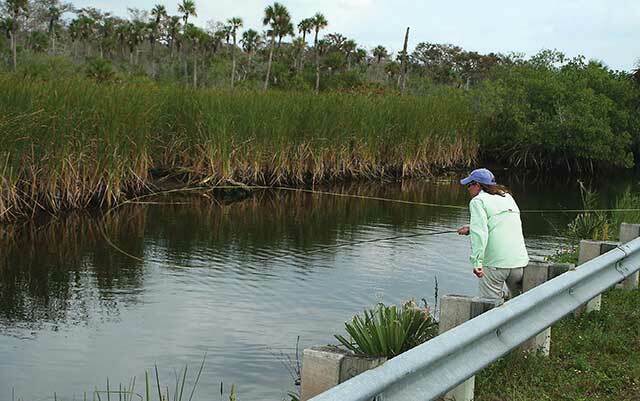 Constructed during the late 1920s, with the intention of stimulating commerce between Tampa and Miami, the Tamiami Trail (U.S. 41) has remained a mecca for anglers—ﬂy ﬁshermen especially—since it ﬁrst opened to trafﬁc in 1928. It was the ﬁrst road to cross the swamps. The trail was popularized by outdoor writers who ﬁshed it during the 1950s and 60s. While the brackish portion of the Tamiami comes within a few miles of the Gulf, the ﬁrst 100 miles west of Miami are freshwater habitat—similar in appearance to other Everglades canals. This part contains both bass and panﬁsh. Depending on water levels, ﬁshing along the trail varies from somnolent to spectacular, with most of the action taking place during spring. In the summer, afternoon showers drown out the bite. 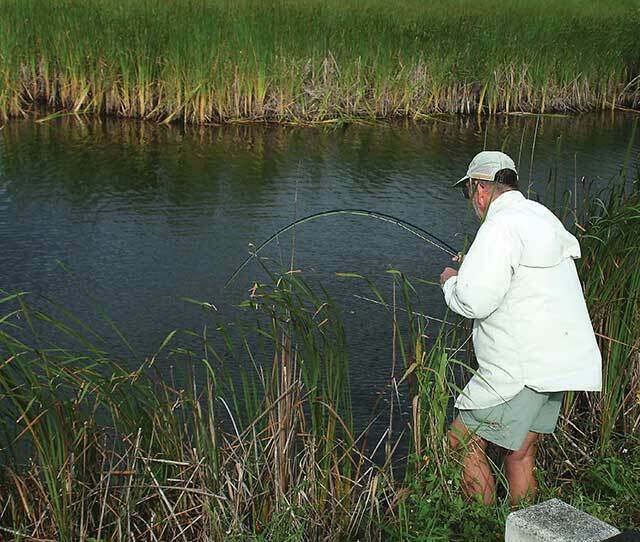 It’s a fact of life in the Glades: High water puts a damper on ﬁshing. Fighting a snook in the Tamiami. The trail is an extension of Miami’s SW Eighth Street, a road referred to by Miami’s Hispanic population as Calle Ocho. This heavily traveled street becomes a highway and crosses Interstate 95 and Florida’s turnpike before continuing west toward the Glades. Trafﬁc on the trail is slower than on the alley, since this two-lane relic is popular with sightseers. Unlike Alligator Alley, which parallels the Tamiami approximately 25 miles farther north, the Trail offers anglers ample bankside access. If you head west from Miami, you’ll notice several makeshift boat ramps. The one Marty Arostegui and I use is located 23 miles west of the Krome Avenue intersection, just this side of the microwave tower. Several canals come in from the north—including L-67A, 10 miles west of the Krome Avenue Extension—and you’ll ﬁnd a few levees that you can reach on foot. There’s a launch ramp on L-67A, just a few hundred yards from the trail. Plus, if you take the levee road even farther, you’ll ﬁnd a second ramp on L-67C: a canal affectionately known as the “Magic Canal” because of the trophy bass it produces. This snook hit a Squid Fly. The farther west you travel on the trail, the more bridges you’ll see. While some span creeks that are essentially mud holes, others hold bass and bream. At the time of this writing, the federal government is raising up the Trail’s eastern portion in an effort to facilitate sheet ﬂow: natural runoff headed for Florida Bay. The areas around bridges—like those near the Turner River campground, or Halfway Creek— harbor ﬁsh during late spring when the current is running. You can usually ﬁnd somewhere to park near these bridges, which, here in the interior, are typically short ones. Just be sure to pull off the road completely. Fishing from some spans is prohibited (there is no room for standing), so the best way to approach them is from either side, by casting beneath them or along the shorelines. A sign will be posted if ﬁshing’s prohibited; if not, you’ll probably ﬁnd a sidewalk. The trail’s crowning glory begins with the salt marsh. Whether a largemouth bass or a 30-pound tarpon, predators rely on the shadows cast by bridges, from which they attack baitﬁsh or grass shrimp. Individual tarpon prowl while snook and bass typically suspend in schools. My strategy for casting under these bridges while remaining dry—though I wouldn’t recommend it to those who are afraid of breaking their ﬂy rod—is to stand on the abutments that frame these bridges and launch a backhanded water haul. Aim well into the shadows, at least 20 feet back. Trophy largemouth require a careful approach and proper presentation. Most trophies are spawners: females in prime condition. Here in South Florida, largemouths spawn from the full moon in November until the end of April. Waders shouldn’t have any trouble spotting the beds, which are usually protected by emergent vegetation. You’ll ﬁnd them in 11⁄2 to 3 feet of water. Look for depressions on the bottom the size of saucers. Bedding bass, however, prefer calm lagoons surrounded by grass atolls. Most spawner ﬁshing is a matter of sight-casting with weighted plastics. However, bedding ﬁsh in the Everglades also strike on top, a proclivity that attracts a small cadre of ﬂy ﬁshers. Approach bedding ﬁsh with caution, while determining if the lady of the house is home. Spawners, for the most part, are easy to spot when they hover close to the nest. That, however, isn’t always the case, so make sure that no ﬁsh are guarding the bed before moving on. I’ll toss something squirmy to bedding ﬁsh and then allow it to settle while I gauge their reaction. If two ﬁsh are present, which they frequently are, I’ll catch and release the smaller, more aggressive male before working on the female. Spawners don’t behave like feeding ﬁsh. They’ll pick up a lure just to carry it off the bed but pay it no mind at all if they’re actively spawning. While a subtle twitch may trigger a strike, the odds are in your favor if you simply let it lie. Short plastic worms and crayﬁsh imitations are ideal for this work. Bedding bass respond to ﬂies, especially those patterns that mimic a threat—for example, a prowling water snake. Keep in mind when you’re dealing with bedding ﬁsh that they typically hang out in heavy cover—often inside a rim of grass—which makes it difﬁcult to present a lure with freshwater ﬂy gear. A 9- or 10-weight makes the job less daunting, since the heavier line pulls the ﬂy to the surface. It’s also easier to cast the gargantuan ﬂies that big bass prefer. A heavier rod is inﬁnitely better for handling 15- or 20-pound tippets, which you’ll need to extract ﬁsh from weedy labyrinths. Another technique that’s effective for spawners, or ﬁsh that have recently spawned, is to reel a 10-inch worm along the shoreline. While you’ll see very few shorelines in the marsh, I remember this trick when I come across one, especially in winter when the bass are spawning. It’s also effective in canals. Here’s why: In canals, bass spawn over shallow gravel patches that form when the banks cave in. Since beds in these areas are difﬁcult to spot, especially late in the day when spawners are active, you’ll need to cover lots of water. And that’s where reeling big worms comes in. You’ll deal with mats of vegetation punctuated here and there by openings. Say you’re casting a weighted plastic—keep reeling it across the mats and dropping it into the holes. While you allow it sink, you need only twitch it (just like when you’re ﬂippin’), while staying alert for the slightest movement. Don’t be surprised if a bass explodes before you reach the hole. Drop your tip before rearing back the second your line comes tight. For this type of ﬁshing, I prefer plug-casting gear, along with a heavy, non-stretch line—say, 30-pound PowerPro. 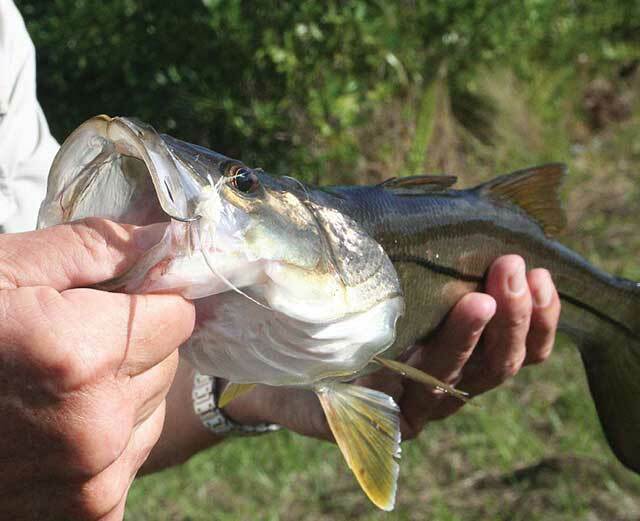 Bass that are not spawning move around more than most anglers realize. These movements are dictated by a variety of factors, including water level, time of year, and ambient light. It’s not unusual if an area that previously held ﬁsh becomes suddenly devoid of them because the bass have moved to different cover—where you couldn’t buy a strike before. 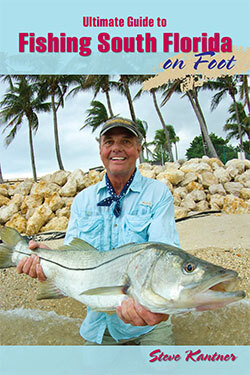 Excerpted from the Ultimate Guide to Fishing South Florida on Foot (Headwater Books, reprinted with permission).